Logan, Air Actuated clutches for Well Service Rigs and Workover Rigs, have a unique cylinder-piston design, which is lighter in weight, and eliminates air tube diaphragms. The Logan LVC series clutch is an air activated, multiple disc, dry disc pack design, which transfers, smooth, maximum torque transmission within a relatively short axial length. Release Springs within the LVC clutch disc pack ensures consistent, reliable disengagement. Reinforced friction discs provide improved shear and flexural strength over industry standards. The Logan LVC cylinder-piston, and O-ring design eliminates the need for air tubes and bladders, which are prone to leaking in hot and cold operating conditions. Plus, our cylinder-piston “wiper” feature maintains a clean sealing surface for piston seals. Larger bore accommodates larger shaft sizes over industry standard. 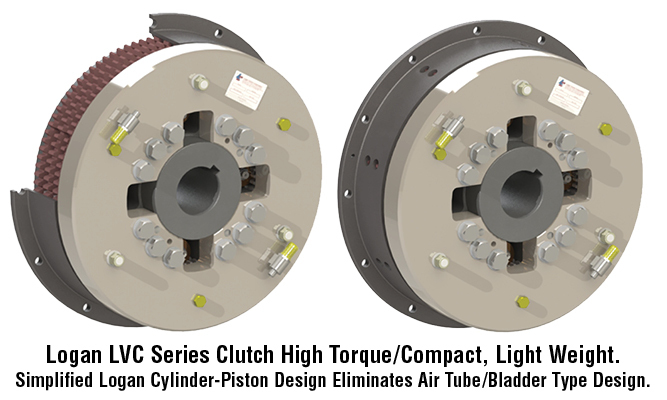 The Logan LVC clutch cylinder-piston, and disc pack design provides more clamping force and 10% more torque transfer than competitor clutches – all within a design envelope that is reverse compatible and significantly lighter in weight than Twin Disc™, Wichita and WPT type PO Clutches. The Logan LVC design can reduce overall rig weight by several hundred pounds, which goes a long way when complying with state and federal on-highway load regulations during rig transport from job to job. Simplified cylinder-piston, o-ring design, eliminates air tube or bladder type leaks, providing maximum performance in cold and hot operating conditions. You are saving trees by using the eco-friendly print page provided by Virteom! Thanks!